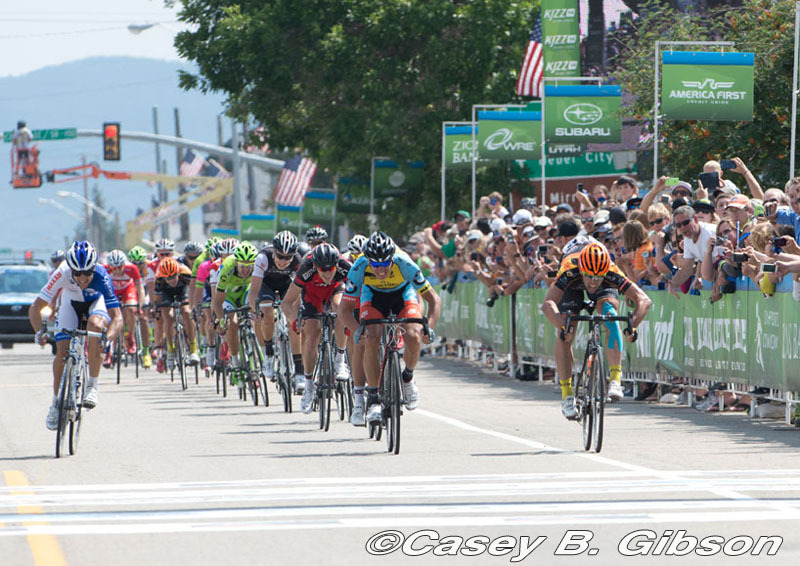 American Eric Young (Optum p/b Kelly Benefit Strategies) surged past the field in a sprint finish to Kamas to cap off Stage 5 presented by Subaru at the Larry H. Miller Tour of Utah. The stage started in Evanston, Wyoming on Friday morning, marking the first time the Tour of Utah had traveled roads outside the Beehive State. Jure Kocjan (Team SmartStop) retained his Utah Sports Commission sprint leader’s jersey by finishing second and UnitedHealthcare’s Kiel Reijnen was third. Tom Danielson (Team Garmin-Sharp) continued for a second day in the Larry H. Miller Dealerships Overall Leader jersey, finishing safely in the bunch in Kamas. The overall leaderboard remained unchanged on the General Classification. Danielson retained his 57-second lead over Chris Horner (Lampre-Merida) and Ben Hermans (BMC Racing Team). Following Scenic Highway 150, known as Mirror Lake Highway, through the Uinta Mountains, the peloton climbed the highest peak in Tour of Utah history with the 10,759-foot summit of Bald Mountain Pass. With a long, fast descent to Kamas, located to the east of Salt Lake City, the stage was set for a 38-mile loop through the Kamas Valley, including a two-mile section of dirt road and the finish in Kamas. Young’s Team Optum squad spent a lot of time on the front of the peloton to bring back a strong six-man breakaway in the final three miles of the race. The break included two ProTour favorites, Jens Voigt (Trek Factory Racing) and Brent Bookwalter (BMC Racing Team). When the breakaway was caught with less than two miles to go, the race was on. With two of the seven stages remaining, Danielson said the pressure of defending his Tour of Utah title was beginning to mount. “It's been a lot different (than last year) from day one. Having the number one on your back and having good form really puts a responsibility on the team. My Garmin-Sharp teammates have been really awesome from day one. We have a young team. Two of the young guys just finished their first Tour de France, so that's pretty impressive that they were able to come from there to here,” Danielson said, referring to American teammates Alex Howes and Ben King. Garmin-Sharp’s ability to handle that pressure will be put to test on Saturday for Stage 6 presented by University of Utah Health Care. The 2014 Tour of Utah “Queen Stage” covers new territory on the 107.2-mile route with close to 13,000 feet of elevation gain over four Ski Utah King of the Mountain climbs. Salt Lake City will host the start for Stage 6 outside Rice-Eccles Stadium, the site of the Opening and Closing Ceremonies of the 2002 Olympic Winter Games and home for University of Utah football games. The route concludes with the legendary six-mile climb into Little Cottonwood Canyon for the finish at Snowbird Ski and Summer Resort. 46 Rob Britton (Can) Team SmartStop all s.t. 3 Ben Hermans (Bel) BMC Racing Team s.t. 6 Alex Diniz Correia (Bra) Funvic Brasilinvest - Sao Jose Dos Campos s.t.